Nigel Farage is a British politician who has stood as a candidate representing the eurosceptic UK Independence Party (UKIP) since 1994. He has been a Member of the European Parliament representing South East England since the 1999 election, winning re-election three times. Farage has stood for election to the House of Commons seven times, in five general elections and two by-elections, but has not won any of those elections. He was also a proponent of the UK leaving the European Union in the 2016 referendum, in which the electorate voted to do so by 52% to 48%. Farage was voted UKIP leader in the September 2006 leadership election, and led them in the 2009 European Parliament election in which his party won the second-highest number of votes and seats after the Conservative Party. He resigned as leader later that year in order to concentrate on the 2010 general election. In late 2010, he was voted leader for a second time after the resignation of Lord Pearson of Rannoch. 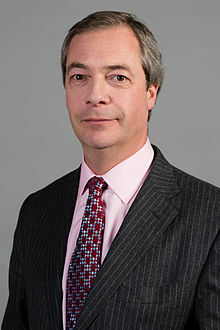 Farage led UKIP in the 2014 European Parliament election, in which his party won the most votes and seats; this was the first time since the December 1910 general election that Labour or the Conservatives did not get the most seats in a British nationwide election. He resigned as UKIP leader after the 2016 referendum. The first election to the House of Commons that Farage contested was the 1994 Eastleigh by-election. After standing unsuccessfully for election in the next three general elections, all in a different constituency, he stood in the 2006 Bromley and Chislehurst by-election, in which he finished third with 8.1% of the vote. In the 2010 general election, Farage stood against the Speaker of the House of Commons, John Bercow, in the constituency of Buckingham, again finishing third with 17.4% of the vote. Five years later, he stood in the general election in the constituency of South Thanet, finishing second to the Conservative Craig Mackinlay, with 32.4% of the vote. Elections to the House of Commons are decided by first-past-the-post voting. Each voter votes for one candidate, and the candidate who receives the most votes in each constituency becomes a Member of Parliament. Up to and including the 1994 election, British elections to the European Parliament used the first-past-the-post system. Since 1999, all British elections to the European Parliament have been done by a proportional representation system, in which each voter votes for one party in their constituency. The seats allotted for the constituency are then divided between the parties depending on their share of the vote. Elected candidates are named. Brackets indicate the number of votes per seat won. ^ Bennett, Asa (24 June 2016). "Nigel Farage has earned his place in history as the man who led Britain out of the EU". The Daily Telegraph. Retrieved 24 June 2016. ^ Whitehead, Tom (8 June 2009). "European elections 2009: Ukip claims political breakthrough". The Daily Telegraph. Retrieved 31 May 2016. ^ Sparrow, Andrew (5 November 2010). "Nigel Farage returns as Ukip leader". The Guardian. Retrieved 31 May 2016. ^ Wintour, Patrick; Watt, Nicholas (26 May 2014). "Ukip wins European elections with ease to set off political earthquake". The Guardian. Retrieved 31 May 2016. ^ Farage, Nigel (5 February 2013). "Nigel Farage: Why I will not fight the Eastleigh by-election". The Daily Telegraph. Retrieved 31 May 2016. ^ Wilkinson, Michael (5 March 2015). "What is the First Past The Post voting system?". The Daily Telegraph. Retrieved 31 May 2016. ^ "UK Parliament Byelection, 9 Jun 1994 - 'Eastleigh'". Election Web. Archived from the original on 5 June 2016. Retrieved 31 May 2016. ^ "Salisbury". Politics Resources. Retrieved 31 May 2016. ^ "Bexhill & Battle". BBC News. Retrieved 31 May 2016. ^ "Result: Thanet South". BBC News. Retrieved 31 May 2016. ^ "Labour and Tories suffer at polls". BBC News. 30 June 2006. Retrieved 31 May 2016. ^ "Buckingham". BBC News. Retrieved 31 May 2016. ^ "Thanet South". BBC News. Retrieved 31 May 2016. ^ "The Voting System". European Parliament. Retrieved 31 May 2016. ^ a b "European Election: South East Result". BBC News. Retrieved 31 May 2016. ^ "European Election 2009: South East". BBC News. Retrieved 31 May 2016. ^ "South East Euro Candidates 2014". UK Polling Report. Retrieved 31 May 2016. ^ "South East". BBC News. Retrieved 31 May 2016. ^ "UK INDEPENDENCE PARTY (UKIP) LEADERSHIP ELECTIONS 2002-2010". Essex University. Retrieved 31 May 2016. This page was last edited on 29 August 2018, at 14:52 (UTC).